Marston Hall's inner core was completely removed, including most floors. Structural scaffolding was installed to temporarily support the remaining floors and domed roof. After initial mobilization, the project became a casuality of the nationwide workforce shortage. Structural steel erectors were understaffed and the project fell three months behind schedule. A well-coordinated construction team schedule was thrown into chaos. The August 2016 completion date had to be maintain so the College of Engineering could reoccupy the building for the surge of students arriving for the Fall 2016 semester. ACI Mechanical used the delay to completely BIM model the mechanical systems. A constant flow of field measurements were transferred back to our modeling team. The model produced a coordinated layout which allowed our manufacturing facility to prefabricate four floors of ductwork and HVAC piping mains and branch lines. Extensive prefabrication reduced our rough-in durations by two weeks per floor, allowing the finishing trades an equal headstart. 80% of the basement mechanical room HVAC systems were prefabricated offsite, and were installed while the upper floors received their finishes. The Dean of the College of Engineering moved into her completely remodeled LEED Gold building in early August 2016. On the grounds of Iowa State University, Marston Hall has served as the home of the College of Engineering for more than a centry. Built in 1903, Marston Hall reflects the University's proud history and its role in educating generations of engineers. 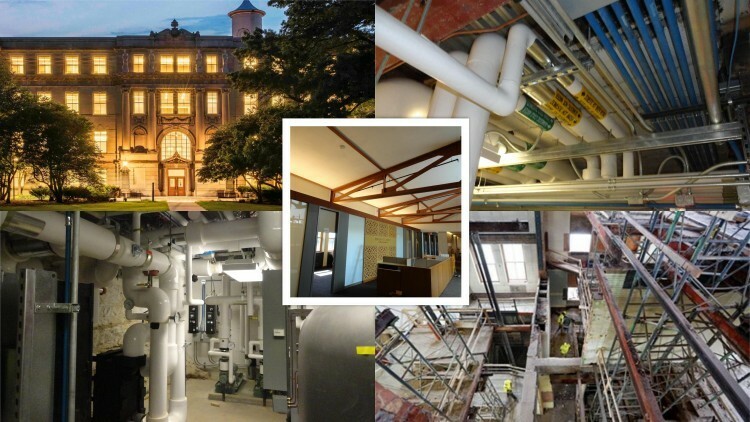 Marston Hall has sustained several remodels in its 100+ year history, but in 2015, nearly the entire core was completely removed and reconstructed.